The Fordham Brewing Company is releasing their increasingly sought after Spiced Harvest Ale in six-packs for the first time this August. After listening to countless customers detail their quests to find the pumpkin flavored ale, with many buying Fordham variety packs just for the Spiced Harvest Ale, the brewery has decided to make the popular product more readily available. 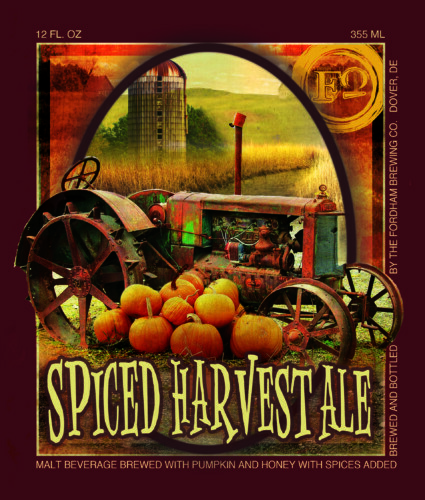 A light amber color, this medium bodied ale is spiced with cinnamon, ginger, allspice, clove and a whole pumpkin. At 6.6% ABV, it is considered by many fans as the best pumpkin flavored beer available. This seasonal beer will be offered in six-packs and on draft. Fordham and Old Dominion have been brewing high quality beverages in Dover, Delaware since 2003. They provide tours of the brewery (located at 1284 McD Dr., Dover, DE) and provide samples of their products, such as Scotch Ale, Oak Barrel Stout, Baltic Porter and Copperhead Ale every Wednesday at 5:00 and 6:00pm, Friday at 4:30 and 6:00pm and Saturday at 12:30 and 2:00 pm. For more information, visit olddominion.com, fordhambrewing.com or contact Lauren Bigelow at 302.678.4810 Ext. 201.